Kendyll Hillegas is proof you can make a living by playing with your food. By day, the Quincy-based artist is a commercial food illustrator, creating spot illustrations and package labels for editorial and corporate clients all over the world. 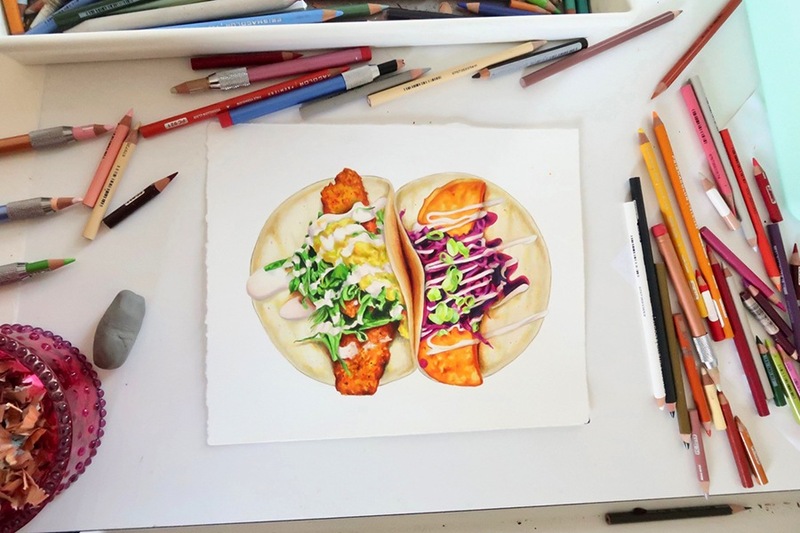 Hillegas began drawing food as a passion project, but this week, she will unveil her first-ever art show, featuring mixed-media paintings of iconic Boston food. 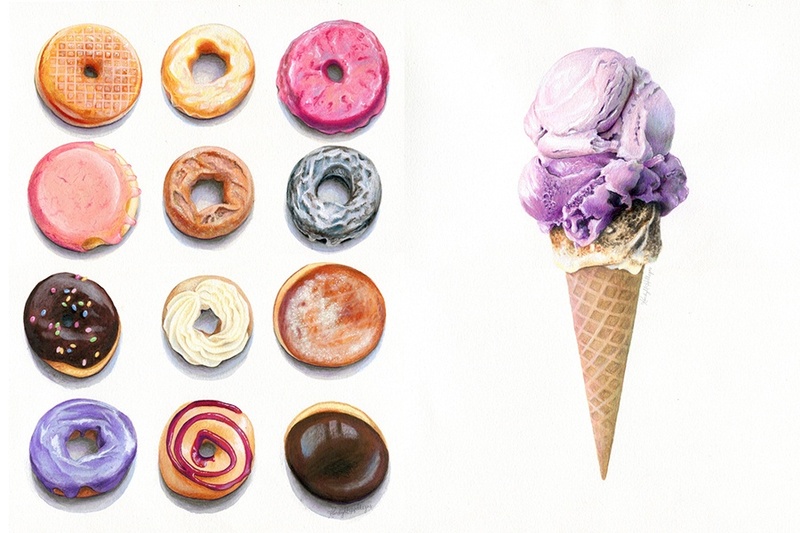 Entitled “Feast: Food Is Art,” 11 of Hillegas’s works will be on display at Gracie’s Ice Cream in Somerville through mid-December. 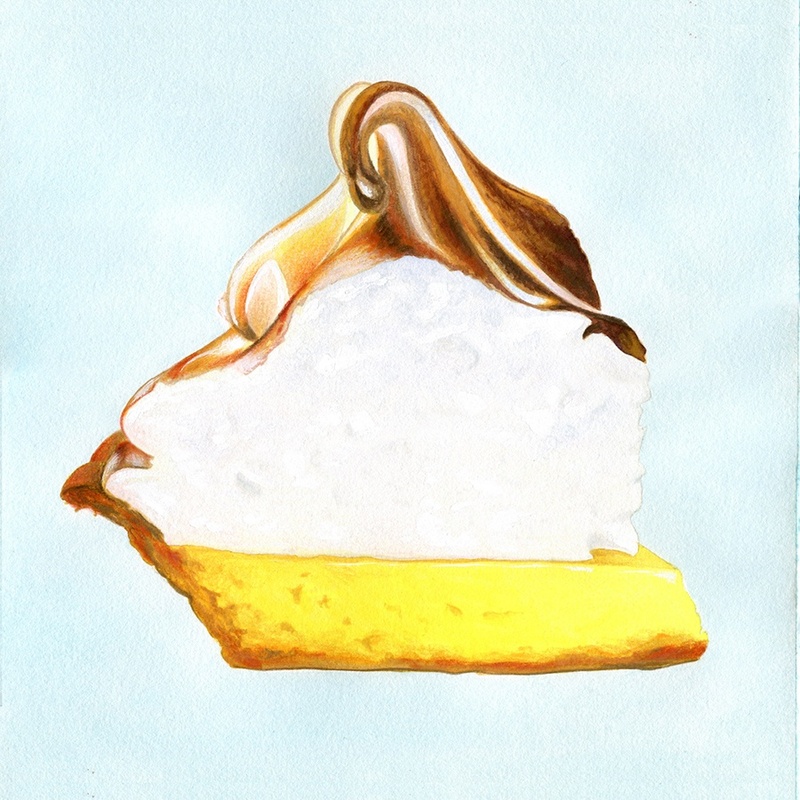 The artist’s bold, modern, and realist style depicts recognizable foodstuffs—tacos, pizza, doughnuts—as interpreted by some of the area’s most beloved restaurants, from Mei Mei’s Three Sisters dumplings, to Flour Bakery’s mile-high lemon meringue pie, to a cocktail from Trina’s Starlite Lounge. The framed artworks—typically layers of watercolor and colored pencil—go up inside the Union Square ice cream shop on Wednesday, and Hillegas hosts an opening reception at Gracie’s on Thursday evening, November 29. The paintings are on sale this season, with all proceeds supporting Community Servings. Hosting the charity art show is serendipitous, Hillegas says. In 2012, when she began sketching her food and uploading the results to Tumblr, Hillegas was also dealing with some health issues. Drawing her favorite snacks was a comfort, she says. “I remember one I did, it was Pop-Tarts, which is a nostalgic, childhood food that brought back a lot of great memories,” she says. She didn’t think she would ever make a living at it, but she got her first commercial clients within a year. “I love that I’m able to do this for work, but I wanted to reconnect with the part of me that wanted to do it out of just love of food,” Hillegas says. 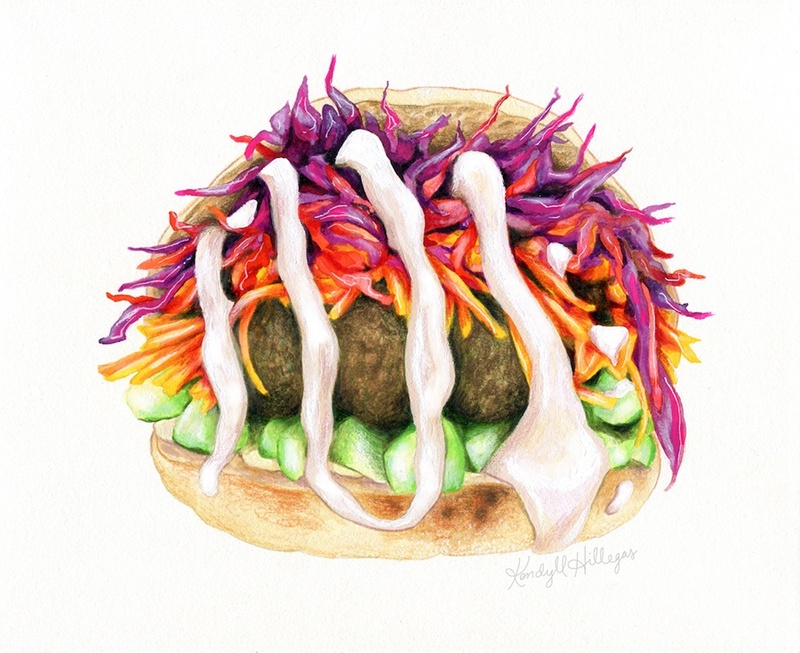 As the social media project grew, Hillegas began calling local restaurants and chefs she loves to inquire about drawing their food. When she phoned Gracie’s Ice Cream, owner Aaron Cohen invited her to display the collection. Because the show is happening during the holidays, she wanted it to support a local non-profit, and she chose one close to her heart. “[Community Servings’] mission to provide meals for people who are experiencing dramatic or chronic health issues really personally drew me in because of starting drawing food when I was struggling with health issues myself,” Hillegas says. The paintings are priced this season between $50-$200, with Hillegas collecting just the cost of framing and donating the rest to the Jamaica Plain non-profit. Check out the lineup of “Feast” works below, and see more of Hillegas’s art on Instagram and her website. “Feast” will be on display at Gracie’s through December 20, with sold artworks shipping out on December 21. Feast: Food Is Art by Kendyll Hillegas Opening Reception, Thursday, Nov. 29, 7-9 p.m., Gracie’s Ice Cream, 22 Union Sq., Somerville, Facebook.